Discussion in 'Golden Oldies' started by DavidFL, May 21, 2008. 91 was a good wet season. & some of the roads were down. R1150 was still dirt & being built. In the pic below, note the size of the tree on the right hand side & compare it to the size today. In Sept 94, R1095 Tha Ton - Mae Chan, had a flash flood around Suk Ruthai approx 20kms norh of Tha Ton. Absolutely stunning, and fascinating too. I was around in LOS then but never came up North. I was messing about down in Kanchanaburi. Were you mostly on your own in those days Dave? Just teaming up with guys passing through or were there some crazy ones like yourself? Thanks for sharing these photo's David. Fully agree. Not boring at all. Really interesting. It might be an idea to store these photos as a historical record. I think you may be surprised how many people would take an interest. those where hard time, I remember when I came here on -97 and we had first really bad floods in Ubon in -98, half of the town was under the water and from Ubon to Warin(some of you know the near by town) army was transporting people by they military trucks, Ubon was under water about 2months that time. I had low rider (car) that time and could not use it for anywhere so had to pick up uncles pick up to do business or generally go any where,, I'll try to look those pictures, they are some where. No trouble to stick em up. Start another thread probably. R1129 Chiang Saen - Chiang Khong, on the "new" dirt road going over Kiu Khan Hill. The guy on the right still rides & lives here - Art is the longest serving English teacher at CMU. The watchtower on the hill was manned by the army in those days & they liked to know who was coming & going. The old road was flat, straight through the rice paddies & they were forever repairing it cheaply. It was years before it was finally done properly, so in the wet season it was always a mess after heavy rain. Some politicians & karachagans must have made a lot of money from all the repair contracts they gave out. Too much was always siphoned off & there was never enough left to do the job properly? They once tried brick paving & it only lasted half a wet season. Ha. Ha. What a joke that one was. More of R1129, the Kiu Khan hill between Chiang Saen & Chiang Khong. They just finished the asphalt road in the late 80s & there was a flash flood in the first wet season after the asphalt was complete. This is what it looked like after the wet & they'd cleared a way through. No asphalt left here, just dirt & rocks. The Hmong village on the top of the hill was a beauty in those days. Jon Boyes ran a guesthouse there for about 4 years, wrote a couple of books, (then went home to the Uk.) These were magic times. Lots of super friendly people & good looking Hmong women. Wayne Cuthbert, an Aussie Laverda rider on tour in Kiu Khan. Many a good time was had there & Hmong New Year was always a extremely colourful & enjoyable experience. seeing long forgotten diamonds amongst the really rough! I suppose Jason is now on full-time scanning duties! of the floods a few years back? that even today things are not always benign. awesome pix and great reportage. a motorcycle trip to Kanchanaburi in 1955! Tony "Chicken In A Basket"
David FL "I'll need a push!" Fabulous! Really envy you guys. R1081 & Huay Kon, right at the "top end". Way before the road was asphalt. Above: With David "Dawn" Drechsler, so nicknamed because of his night time "retirement" hours. David Dawn was a great rider & showed me a few tricks on 1081, a road that he'd never been on before..
Are you sure of the date 96? How could I ever forget that hill Scotty. That was the only hill that the old 175 (re-bored from 125) Wing could not pull, & I recall I’d been slipping the clutch in & duck paddling for quite a way before it quit. Thanks for the push by the way, once I got going again I'm sure you enjoyed the little walk up. It would be interesting to try & find that road again & see what it looks like now. From memory it was supposed to be a trail into some Mlabri village / Gene Long's place, but I think at the top we discovered it was the wrong one, so we came back down again, & tried the next one. Not sure if you have considered this but with your wealth of knowledge, memories and photographic history (I know its only 20 - 30 years (photo's not your memory!!) but it looks like 80 - 100 years!) have you considered creating a book? Not just any book. A book that would be able to be merchandised along with the current T shirts, with monies from sales going directly to the Toy Ride foundation. Maybe with the exposure on this forum for this idea, the appropriate backing for such a project could be found? I appreciate this may sound slightly wacky but what we read and see here is history that needs to be documented & shared. Hi David FL, I could be wrong about the dates as film negatives never had that information. It was the wrong track and you did get the right track, to land us at Gene Longs mission. Not sure maybe FL can fill in! Tony after a hard day in the saddle! 1129 when it was all dirt! Didn't mind getting muddy in those days! Songkran 88 at The Library Ratchamankha Lane - Now a pizza shop! FL on a big bike outside The Library Ratchamankha Lane! Yes, indeed quite a few must have made a bundle out of that road as I remember that in 1977 we did that road and it was in the same state as in your pictures - mud and lots of water from the rice paddies on both sides so you could not make a detour to escape some of the worst parts. 1994: The Chiang Mai floods outside the TAT office on the Chiang Mai - Lamphun road. R1150 Phrao - Wiang Pa Pao. The Snail getting it up on the old XLR250. 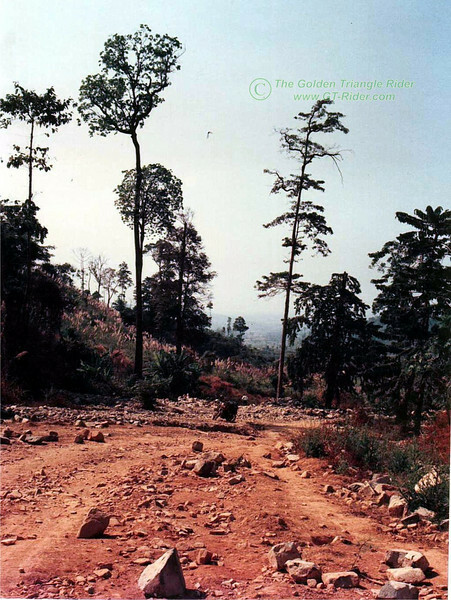 1993: Struggling - walking & pushing - it up R1149 the Mae Sai - Doi Tung Burma border road. On the wet greasy clay couldn't hold it to kick start the Baja & get going again I think was the problem. Having made it up, I got to stand at the top & snap away. Ha. Ha. Several more pics here as well. The Bier Stube in 1990. The bikes out front are a local's C90 Honda, my R100GS, Eddie's XT600 Yam from Switzerland and Ian Ball's R80 from the UK. The bike rental shop next door is still there with the same sign on it, "Running by Mr Somchai"! And to think we complain about a few potholes these days. Fresh "love" in an Akha village up on Doi Tung "a few years ago." Compare the hand sizes & the footware too, not just the height.